Between 2013 and 2015, the Antilope project was focused on the dissemination and adoption of the eHealth European Interoperability Framework (eEIF) as defined by the eEIF study (also known as the “Deloitte study”) published in July 2013. Antilope developed guidelines and recommendations that support the eEIF. They are available under Resources. Based on the results of previous European projects (HITCH and EHRQTN), Antilope developed a consistent framework that will help projects or implementers to deploy their own interoperable solutions. It consists of several interrelated elements that will need to be used at different stages of a project, e.g. specifications, implementation and high level of quality in the testing processes. The challenge for Antilope was to define a comprehensive, usable framework that enables the development of a unified market and improves the quality of the projects and solutions in eHealth. The refined eEIF in version 1: Based on the eEIF study (2013), the Antilope framework offers tools that can be used in solving interoperability problems with respect of inter¬operability consistency over Europe. First of all, it proposes a level scheme, listing the multiple aspects of interoperability that projects need to take care of. Furthermore, it proposes a set of use cases and their implementation described by the corresponding realization scenarios which are linked to a selection of profiles (positively evaluated by the European Multi Stakeholder Platform on ICT Standardization in Nov 2014). Each profile is an implementation guidance specification for the underlying standards for a concrete and interoperable implementation. Click here to download. The Quality Management System for Interoperability Testing: The Quality Management System (QMS) for interoperability testing consists of a customizable description and a set of templates. It allows Conformity Assessment Bodies e.g. testing laboratories, to provide high quality test reports when the QMS is implemented as described. Click here to download part 1 (QMS) or part 2 (testing processes). A coherent set of Testing tools: Antilope provides a portfolio of testing tools that would be sufficient for testing the recognized profiles from the eEIF, and developed an inventory of recommended existing open source testing tools. Key information is provided: target profile tested by tool, tool name, tool developer, tool location and tool info pages and access to source code and category of tools. Finally, Antilope identified gaps and proposed a process to address those. Click here to download. Quality label and certification processes: Antilope provides organizational models, concrete examples and guidance that can be implemented both at the European level and at the national/regional level to preserve consistency at each level. Specific recommendations are presented based on the reusability of the testing plan, test cases and test tools. Extensions are allowed and a number should be leveraged at the European level for their integration in newer versions of the eHealth European Interoperability Framework. Click here to download. The Antilope results are now available for EU projects already in progress, and for future projects linked specifically to PHC34 of Horizon 2020 (and possibly others) to implement and deploy. The following figure shows how Antilope results ideally are taken up by projects and initiatives that are, at the time of this writing, active and in startup or still in their early phase. It is not exhaustive, as Antilope results might be used in other projects as well. The Assets (in purple) will serve as input and references for the projects Health Value, EXPAND and Joint Action of eHN. The projects can provide feedback and suggest improvements of the assets, however, a formal process for the governance of this process is not yet established. The results (in red) will be reused for the purpose of the respective project: selection of use cases, QMS for implementation, testing tools and quality label testing processes. In this way, the results from the Antilope deliverables will be actively used and live on in the projects. IHE-Europe will provide the testing tools portfolio for maintenance to the EXPAND project and assist CEF in the implementation of its testing strategy. The objective is the further dissemination and adoption of the Antilope results as references used by other EU projects as well as national/regional programs or projects. A coordination of these projects should be set up for ensuring consistency and to avoid deviation between them. The next step should be the development of an ISO 17025 based Conformity Assessment Scheme (CAS) at the EU level which establishes the necessary processes for managing the conformity assessment of profiles by testing laboratories. A certified/label product demonstrates that it conforms to specified requirements developed in Europe and described in the eEIF. Furthermore, the WHO has expressed interest in Antilope’s results and strongly advocates to promote their utilization by all Member States in the WHO European Region as best practice for developing a national approach to eHealth interoperability. 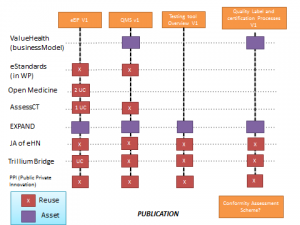 In particular, the eHealth European Interoperability Framework (eEIF) and the use case approach developed by Antilope are considered by WHO to provide an excellent and pragmatic methodology for tackling interoperability at the national level. AssessCT: The ‘Assessing SNOMED CT for Large Scale eHealth deployment in the EU’ project deals with whether it makes sense from an economic point of view for Europe to introduce a single medical language. The website is not yet available. eStandards; This is a coordination and support action to strengthen the standards and interoperability pillar of DAE 2020, by alignment and wide adoption of standards in the eHealth market for products and services. The website is not yet available. Joint Action (JA) of eHN: Since 2012 the eHealth Network (eHN) has been in place as the formal meeting point on eHealth of the ministries of health of the EU Member States, mandated by article 14 of the Directive on Patients’ Rights in Cross Border Health Care. The European Commission (DG Santé) is co-chairing this network with one of the member states. The eHealth Network is creating a Joint Action (JA) to start in the second quarter of 2015 and to run for three years. In this JA various themes will be prepared for policy decisions in the eHN. There is a relatively large work package on Standards and Interoperability within the JA. The website is not yet available. ValueHealth: This project will demonstrate how interoperability of health information can consistently create, deliver and capture value for all stakeholders in order to justify sustainable investments in scaling up interoperability across Europe. The website is not yet available. Antilope is a thematic network partially funded by the European Commission under the ICT Policy Support Programme (ICT PSP) as part of the Competitiveness and Innovation Framework Programme (CIP).